There’s always time to dig in to a home-cooked favorite-even on hectic weeknights. Simply turn to Taste of Home 30 Meals in 30 Minutes! Here, you’ll find a hearty assortment of 30 entrees that get you out of the kitchen and at the dinner table in just 30 minutes. Family faves like one-pot pasta, meatball pizza and suppertime egg sandwiches put you on the fast track to tasty. In addition, a few extra side dishes offer up no-fuss ideas to round out menus. So what are you waiting for? 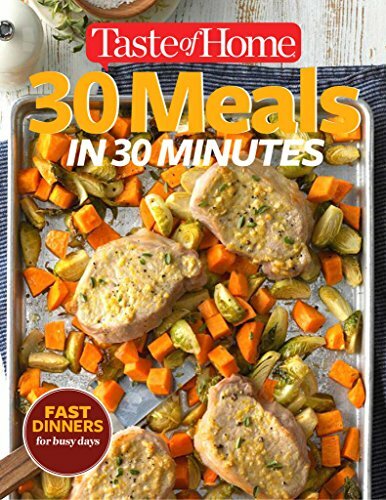 Take a break from the dinner rush and settle in to savory comfort with 30 Meals in 30 Minutes tonight!